Khotan is situated on the southern edge of the Taklamakan Desert. It is an area still dominated by Uyghurs. According to the national census in 2010, Uyghurs account for 96.3% of the population of the Khotan prefecture. Compared to other areas in Xinjiang, Khotan is more difficult to reach and less visited by tourists, which helps to preserve its traditions. The Islamic soundscape of Khotan includes daily salat prayers, Quranic recitation heard in the home and in the mosque, the azan call to prayer, the “helqe-sohbet” ritual, songs of the ashiq Sufi dervishes, as well as Islamic-themed music performed at various occasions such as meshrep social gatherings. 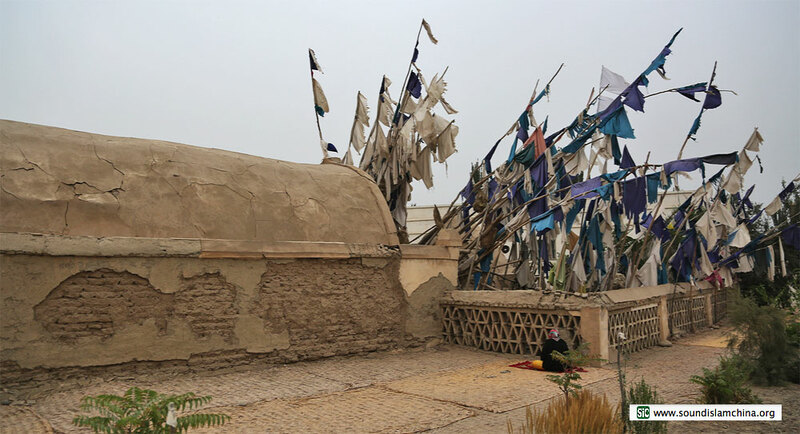 Khotan has a big concentration of mazars (shrines of Islamic saints), which are venues of pilgrimage and often accommodate religious rituals and music, although this has been made difficult recently by the recent crackdown on “illegal religious gatherings”. 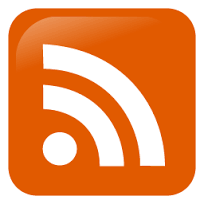 Recorded at the mosque of the Imam Epter Mazar on a Friday. This recording sounds quite different from Middle Eastern styles of the azan, and may be related to local musical styles. The Khotan area, especially Qaraqash County, has a rich tradition of sung story-telling called dastan. The dastan of Imami Huseynim is often sung when people worship at the mazar. It tells the story of the death of the third Shia Imam Husayn ibn Ali. This is performed by Ubulhesen Memet, who makes his living mostly by performing in the local bazaars. Meshrep is a kind of social gathering organized by host families to entertain guests with food and music. The term also refers to a musical repertoire: the concluding section of the Twelve Muqam, which mainly consist of songs sung by the ashiq. It is also the name of the wandering dervish and poet Mashrab, whose poetry is prominent in the meshrep sections of the Muqam. He is especially popular in this region, and his poetry mentions Khotan more than any other place where he lived. This video shows a meshrep song sung at a meshrep gathering. The song is now included in the Meshrep section of the Chebiyat Muqam. Many people are playing a percussion instrument called sapaya to accompany the singing, as is common in collective musical activities in this region. Some people call the sapaya the “beggar’s instrument”, as it is often used by ashiq who live on alms. 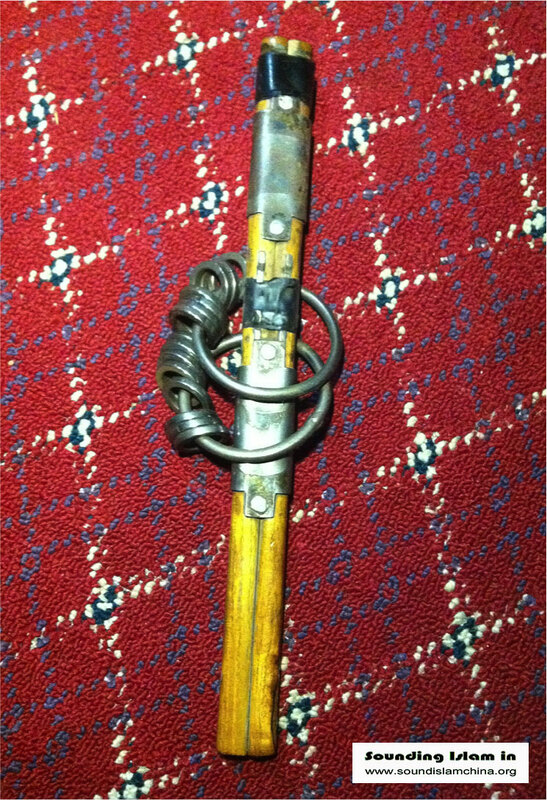 This instrument probably helps to induce a state of trance; it is loud, and is played very close to your ears. I have found when I have been playing the sapaya, that if you play a repetitive rhythm for a while, and sing loudly at the same time, lacking oxygen, with a group of people who are doing the same, it is quite possible to enter an altered state of consciousness. At the end of the song, they recite a du’a, prayer, as people in Khotan do many times a day, when they eat, greet guests, or pass by mazar. One of the most important parts of the Islamic soundscapes of Khotan is probably the “helqe-sohbet” ritual. Literally meaning circling and talking, it involves chanting God’s names (zikr), singing, instrument playing, dancing, ritualized crying, and altered states of consciousness. Helqe-sohbet is a uniquely local expression of the Sufi tradition of samā. In Khotan, it is a regular activity among pious locals. Although such gatherings are currently banned in public spaces, helqe-sohbet still take place in private homes, and are sometimes combined with a meshrep. The musical elements of helqe-sohbet may include hikmet (“pieces of wisdom”) lyrics attributed to the 12th century Sufi saint Yasawi; meshrep songs; and dastan epic songs about Islamic saints. In the zikr part, people practice rhythmic breathing and a circling dance, which can lead them into a state of trance. The Twelve Muqam as we know it now is a musical canon that represents the Uyghur nation, usually performed by large ensembles of professional musicians. However, muqam used to be, and still are, local traditions passed down from master to apprentice, and they are heavily influenced by Sufism. This song is now part of the meshrep section of Chahargah Muqam, and the lyrics are all about wandering Sufi qalandar. Ubulhesen is seated centre, playing the tanbur plucked lute. We have seen him in all of these videos. His career reveals the fluidity of Uyghur musicians’ identities. A well-known dastanchi (performer of dastan), he also plays muqam, and sometimes performs at Sufi helqe-sohbet rituals. A meddah is a person who propagates Islamic values through singing and storytelling. This man’s name is Arslankhan. He has no home of his own, nor a phone, and in some ways he is like an ashiq wandering dervish. He usually performs his religious stories in the bazaars, but here he performs a telqin song about Ali at a friend’s home. From these examples we can see that the Islamic soundscape of Khotan consists of many different kinds of musical and other sounds. They can be regarded as one continuum, with the sacred vocalization of the Qur’an at one end, and music performed at more secular occasions such as weddings at the other, but these sounds are all interrelated. 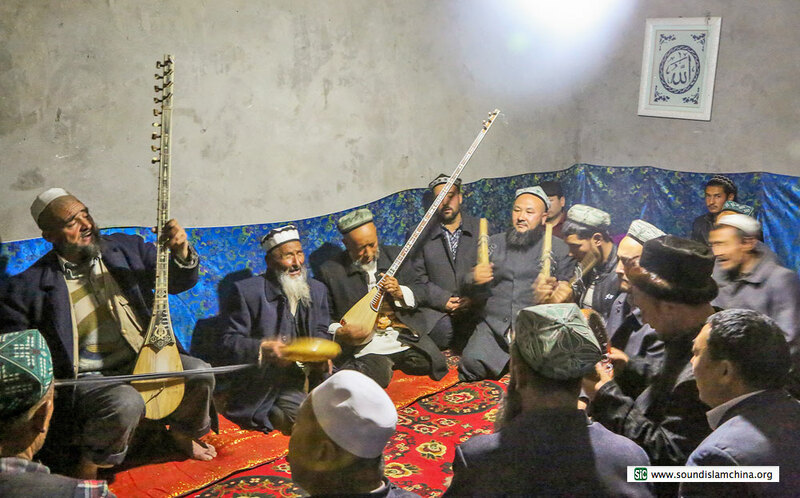 There is a great deal of overlap between religious and non-religious music, as Uyghur culture as a whole is deeply influenced by Islam, and especially by Sufism.